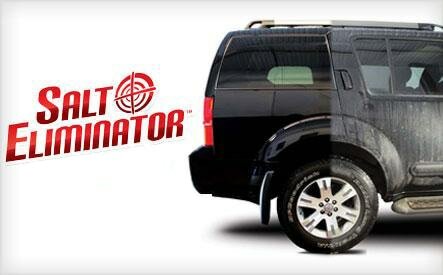 Our Salt Eliminator wash coats the entire vehicle with our proprietary foam spray, including the underside and hard to reach areas. This doesn’t just wash away the salt you can see, it actually changes the chemical composition of the salt so that it no longer sticks to your vehicle and is washed away cleanly. A typical car wash will only wash away salt that has not bonded, which leaves a chalky white residue and causes your car to rust. By completely removing corrosive chemicals from your vehicle, you will reduce your corrosion related failures. When packaged with a Krown Treatment, you will protect your investment by giving it the most comprehensive corrosion control program in the market. Salt Eliminator can also be used around the house. Household uses include boots and shoes, household carpets and mats, snowblowers, locks, and much more. Learn more about Krown's unique Salt Eliminator product here.